Please contact Ryan Scariano at rscariano@eou.edu with questions. The Learning Center employs students with records of academic success in foundational coursework to lead group study sessions. Encompassing subjects from across the academic spectrum, study session leaders work closely with professors to provide homework help, exam review, and extra practice to students taking courses in subjects like biology, history, and psychology—and many, many more! Study sessions generally meet anywhere from one to three times per week. At the beginning of each term, study session leaders visit the classes with which they will be working to determine the best time (or times) during the week to meet with their peers. Most study sessions begin by the second week of the term. Even if you feel like you are not struggling in a class for which a study session is offered, try attending one session just to see what it is like. It is a great way to get to know your classmates, and you may find that the extra practice is just what you need to get the edge on that next test! Want to lead a study session? We hire most of our study session leaders based on recommendations from faculty members, so talk to your professors if you are interested in leading a study session. 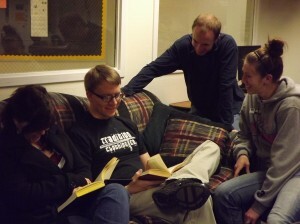 For more information about group study sessions, contact Ryan Scariano at rscariano@eou.edu.